CKEditor is an online rich text editor that can be embedded inside web pages. It is a WYSIWYG (What You See Is What You Get) editor which means that the text edited in it looks as similar as possible to the results end users will see after the document gets published. It brings to the Web popular editing features found in desktop word processors such as Microsoft Word and OpenOffice.org Writer. CKEditor provides all features and benefits users and developers expect from modern web applications. Its amazing performance keeps users focused on things to be done. CKEditor includes all popular features available in text editors as well as additional components specially designed for web contents. We are not claiming that CKEditor is the best editor there is. Our customers and community are saying that, loudly. People enjoy working with the editor, fully trusting it, backed up by our strong and longtime market presence. Visit the CKEditor web site to know more about it, play with the demo and enjoy it! We're not affirming that CKEditor is the best editor out there. Our customers and community are saying that, loudly. People enjoy working with this editor, fully trusting it, backed up by our strong and long time market presence. Visit the CKEditor web site to know more about it, and enjoy it! If you wish to create a thumbnail, click the desired checkbox, then click Upload. The selected image can be resized simply by changing the Width or Height. If you change one, the value for the other will change so that the image is proportional. You can place a value in Border, HSpace, and VSpace to add padding. Alignment allows for placement of the image to the right or left of the text. If you wish to center the image, simply leave "Alignment" as <not set>, then use "Center" from the tool bar. Below you will find an overview of all features available in the default CKEditor toolbar. Save the contents of CKEditor and submit its data to the server, when CKEditor is placed inside an HTML form. See Saving Content. Clear the editing area and create a new page. See Creating a New Page. Show a preview of the document in the shape that will be displayed to end users. See Document Preview. Print document contents. See Printing. Highlight all block-level elements in the document. See Show Blocks. Show information about CKEditor. See CKEditor Version. Apply bold, italic, underline or strike-through formatting to the text. See Bold, Italic, Underline, and Strike-through. Apply superscript or subscript formatting to the text. See Subscript and Superscript. Apply pre-defined block-level combinations of various formatting options. See Paragraph Format. Change the typeface of the text. See Font Name. Change the font size of the text. See Font Size. Change the color of the text. See Text Color. Change the background color of the text. 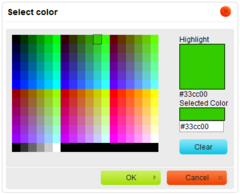 See Background Color. Create a new divelement in document source. See Creating Div Container. Set text direction as from left to right (default value for most Western languages) or from right to left (languages like Arabic, Persian, Hebrew). Insert a link anchor to the text. See Anchors. Insert an Adobe Flash object into the document. See Inserting Flash. 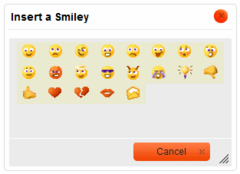 Insert an emoticon image (smiley or icon). See Inserting Smileys. Insert an inline frame (iframe). See Inserting IFrames. Insert a new form into the document. See Creating Forms. Insert a checkbox into the document form. See Checkbox. Insert a radio button into the document form. See Radio Button. Insert a text field into the document form. See Text Field. 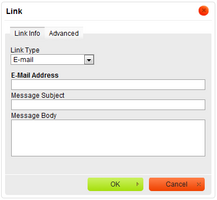 Insert a multi-line text area into the document form. See Textarea. Insert a selection field into the document form. See Selection Field. Insert a button into the document form. See Button. 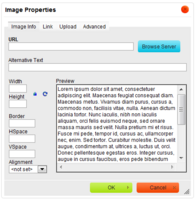 Insert an image button into the document form. See Image Button. Insert a hidden field into the document form. See Hidden Field.